A portrait of a shoe store. That description doesn’t seem to fit the visual content of the photo for me…but it’s what it is. There isn’t anything tremendously eye catching or stunning about this photo, yet I find that I’m drawn to it. It’s captured winter and the effects of a storm, footprints in the unshoveled sidewalk, awning blowing in the wind, water spray on the windows, a desolate street and lonely parking meter, and a grey-washed sky to pull it all together. I love the location of the elements in the frame, and I’m happy with my composition here. 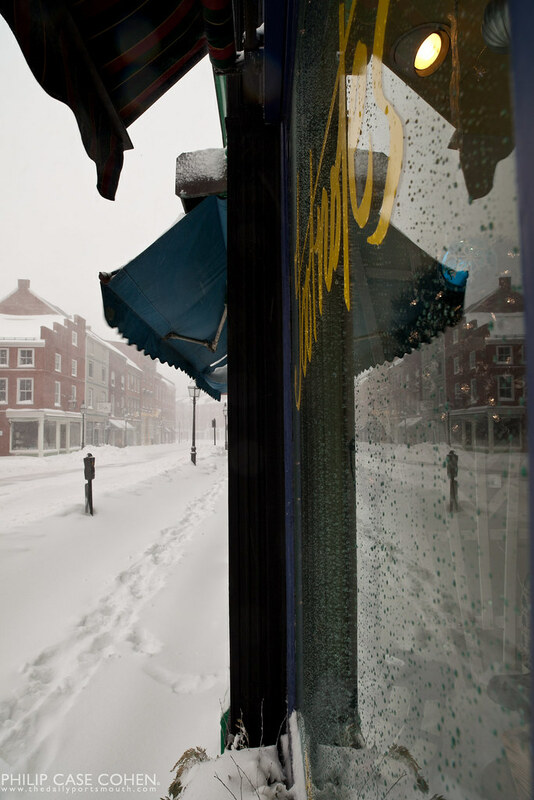 It makes an otherwise simple portrait of a store into a storytelling opportunity, courtesy of some winter weather and some glass. We all have photos that mean something to us, that maybe we doubt the beauty to others, but you captured the essence of the snow storm and the irony of the lonely foot steps in the glass of a shoe store, well done.